Today, it seems that we have some bad news for those who are looking forward to release of the film based on Warcraft’s universe. Yesterday Blizzard announced that World of Warcraft film, anticipated by the fans of Warcraft game series, would be released later. 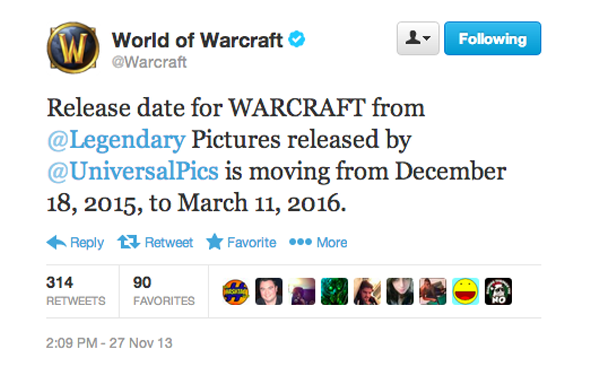 If you remember, earlier this picture was scheduled to be launched in our cinemas on the 18th of December 2015, but now Warcraft movie release will take place 3 months later, namely on the 11th of March 2016. Although exact reasons for such Blizzard’s decision are unknown, but many sources claim that the film is postponed because of the another one incredibly popular masterwork - Star Wars: Episode VII, - which will be released at the same time. So you understand that competing with this saga is incredibly difficult, maybe even impossible. Therefore, in order not to lose any money from the distribution of a motion picture (what is very important thing for its producers), or people who would like to see both films, but they would have to choose which one (on December 18), Blizzard has decided to delay Warcraft movie release. What do you think about it? Will you expect World of Warcraft film? Leave your answers at the bottom of the page, please.